BEFORE: Heck - I didn't even pause to tidy up at all! Keeping it really real. You can see - the ceiling before was the cheapo cardboard ceiling tiles. Cardboard ceiling tiles are a good option - they are cheap and relatively easy to install. But is there a less inspiring ceiling? 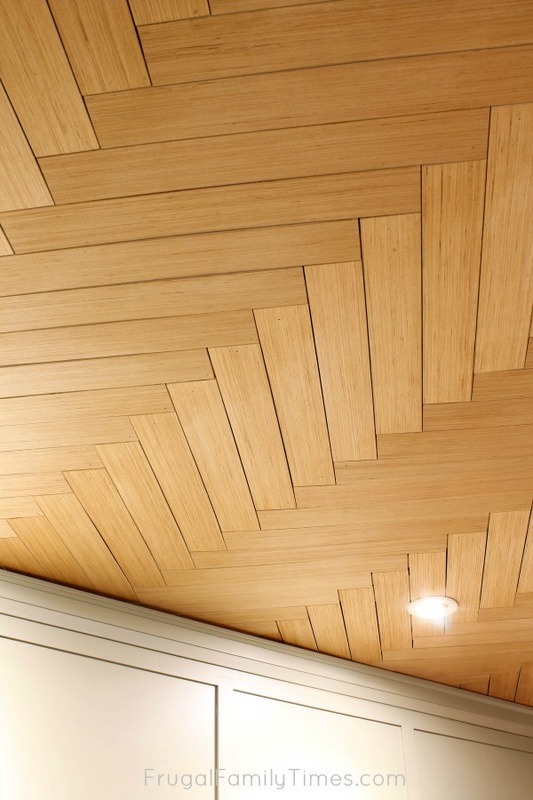 You betcha: a wood herringbone ceiling! And, as I mentioned in our basement guest room plywood ceiling makeover post - they are nearly impossible to fix when one is damaged given how they're installed. (see that droopy row in the photo above?) Ceiling tiles tend to look serviceable only until you need to get behind one for some reason or if someone knocks into it with something. Which in our house of clumsies takes about 4 days. 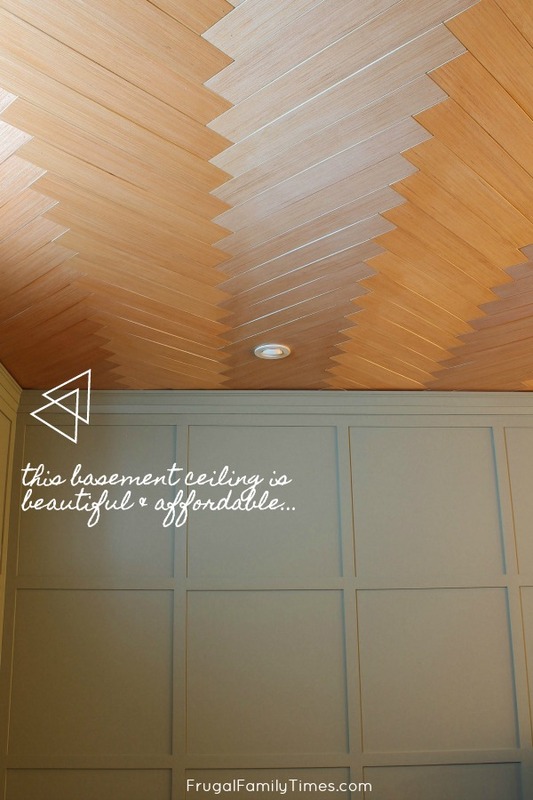 Can you believe this natural wood herringbone ceiling is a BUDGET basement ceiling idea too!?! Ed and I devised and installed it - and I still can't believe how little it cost. And it doesn't look like a plywood ceiling at all. 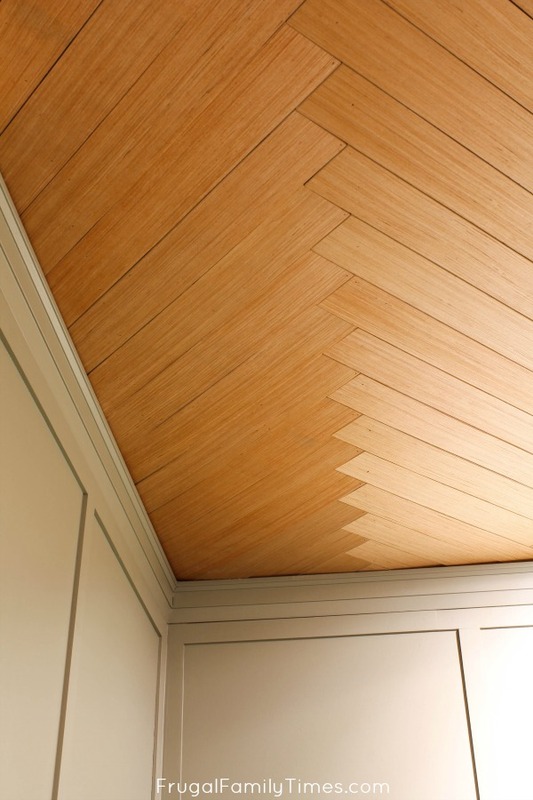 Here's the crazy thing I just realized: our gorgeous herringbone ceiling is actually CHEAPER than cardboard ceiling tiles! Our large room cost about $250. I'm flabbergasted. It had to be unique. Basements are usually boring boxes and need all the help they can get to be interesting. 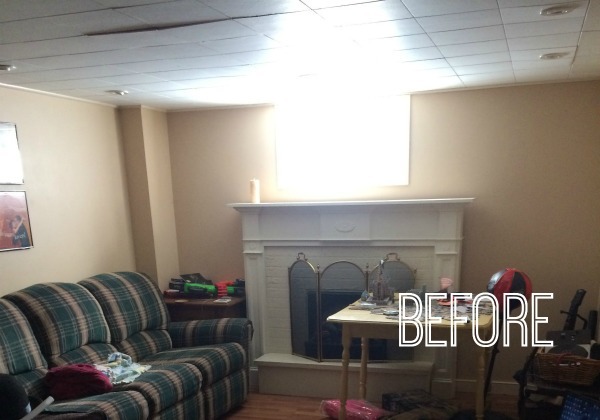 It had to use the same plywood material that worked so well in our basement guest room plywood ceiling. These rooms are adjoining - so tying them together with the same material and finish would create a visual flow that would expand the spaces. Or at very least not visually shrink them. 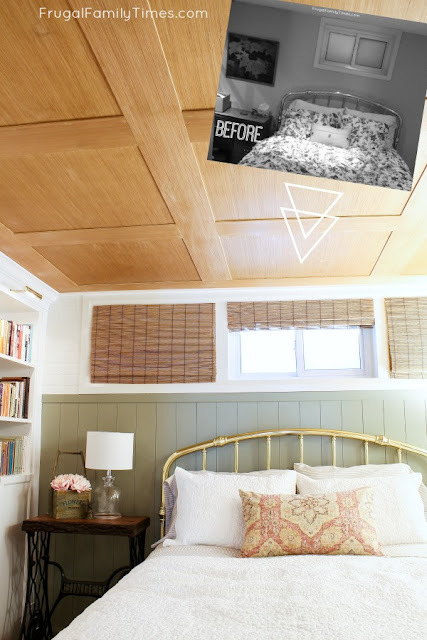 Another very cool thing I figured out for this project - this idea could turn an pesky popcorn ceiling into a thing of beauty! It would be easier to install on an existing ceiling than our basement joist install. You'd never guess it was plywood. I love how the light accentuates the rows of wood planks. It looks handcrafted which feels really special for any room. Speed square - essential to get the angles just right. Optional: soundproofing insulation Rockwool is our favourite. Finish of your choice: we used Tung oil (we found this one smells best and drips least) it gives a handrubbed, crafted look. We then shoved Rockwool insulation between the joists - primarily for sound dampening. Step 2: Prepare the herringbone planks. This plywood comes in 4'x8' sheets which needed to be cut to size. First - we ripped them into 4'x2' boards with the cuts against the grain. This is important! You want the grain to run the same way for all the pieces. Next - we cut those sheets into 3-inch pieces - cutting with the grain. Last - we sanded the edges smooth. Work your way across the room along the joists. If your joists are unevenly spaced - like ours - you'll need to custom cut the planks for each row. 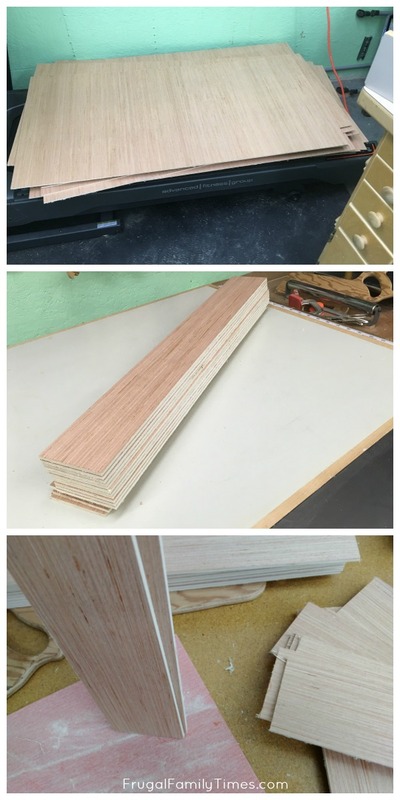 We used both the table saw and our mitre saw for these custom cuts. 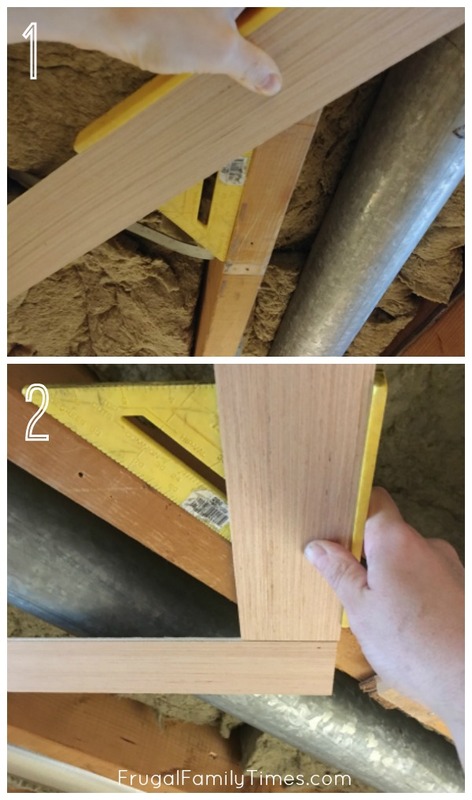 1) Measure the centres of your joists. This distance is your 'a' and 'b' variable. 2) Use a square to mark a line down the middle of a joist. 4) Carefully measure the distance between the end of line (B) and the point at the centre of the opposite joist (A). This is your 'C' - the length of your board. Start in the middle of a given set of joists. 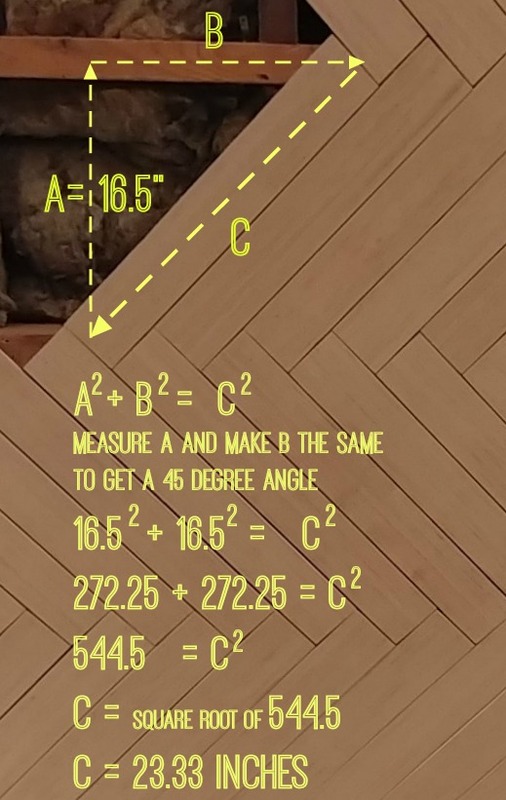 Use a speed square on the joist to create a perfect 45-degree angle with the panel section. Try and balance it evenly between the two joists and nail it - once on each end. RevolutionPly is light, so we only needed 5/8" brad nails. 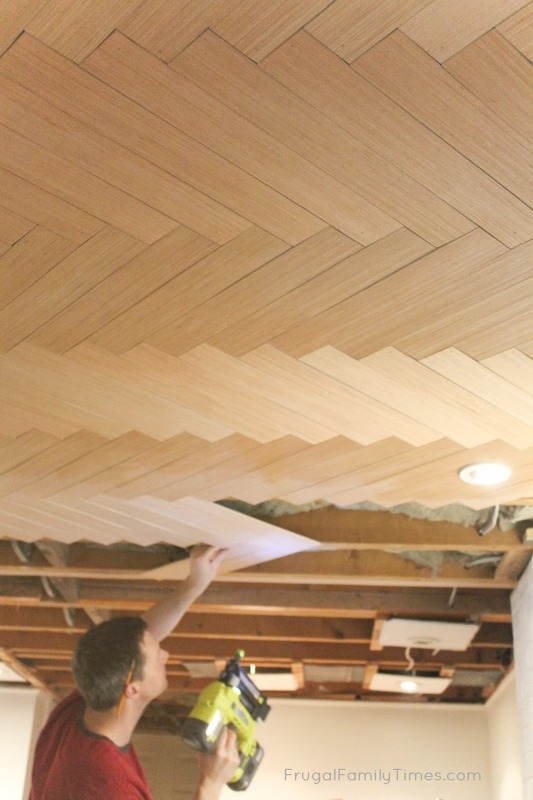 Jump over to the opposite joist and repeat the process for the other half of the herringbone. We initially used a small piece of metal for the gaps between the boards, but it was driving us crazy. So, we ended up just eyeballing most of it. As a result of the eyeballing, there will be minor variations in things as you work. Do not stress about this - when done, you won't see the trees, just the beautiful forest. We had to recess the existing potlights into our new ceiling. This was actually pretty easy. Mark the centre of the exact location for potlights on the plywood. Trace/scribe the potlight in the location marked on the board. Either rewire the potlight through the new hole or use a gap to fit it in. Nail the board between the joists. Finish securing the potlight by whatever method your lighting system uses. You will have to scribe/cut/fit some herringbone boards around the lights, but this is actually easier than it might sound. Most potlights have a good cover system that will hide a lot of sins. We switched all of our bulbs to dimmable LEDs to cut down on heat/fire risk. Step 5: Finish with Tung Oil. We did just one coat of tung oil - we wanted a matte finish. If you want a shiny finish you'll likely want 3 coats. It was pretty straightforward - Ed just wiped it on with a rag. Step 6: Install crown moulding. We'll talk more about this step when we share the tutorial for our grid panelling. 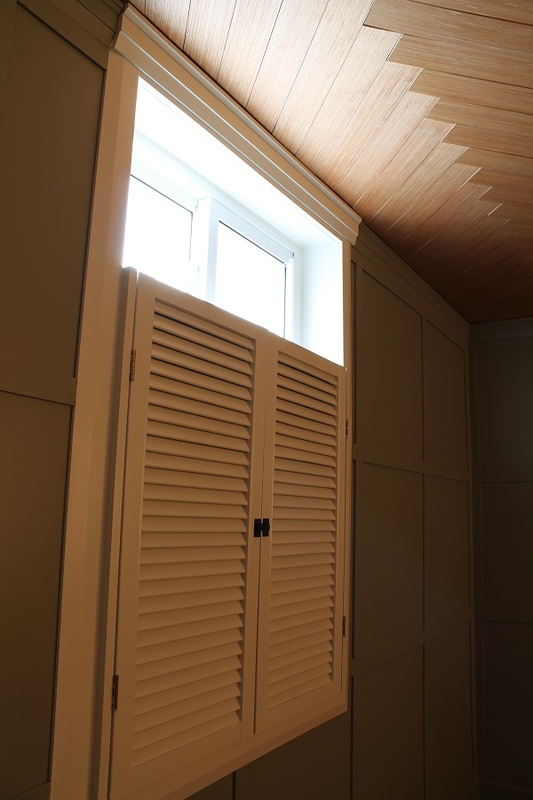 we made this DIY shiplap ceiling in our log cabin bunkie, but it would work just as well as a drop ceiling alternative for a basement. and I'm figuring out how to turn our storage area ceiling into storage - coming soon! Great ideas which I find to be very doable. 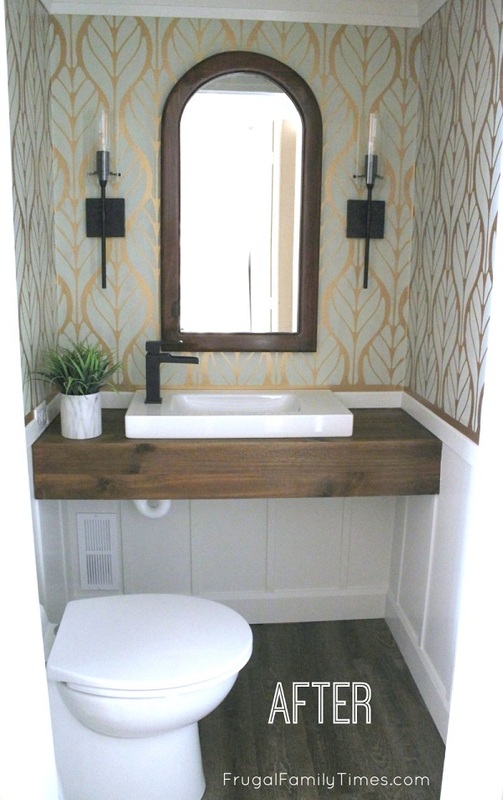 I'm obsessed with your diy blog! I'm a new home owner and it has helped me visualize and dream up new ideas for my half finished basement! 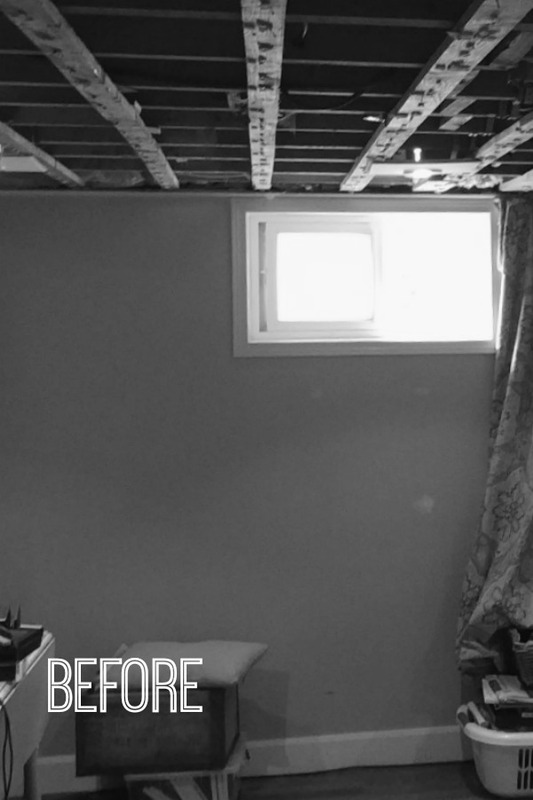 One quick question with this diy ceiling ( which is amazingggg ) I have an exposed basement ceiling, have the pair of you had to get behind this ceiling design to get to wires or pipes? Would it still be possible with this ceiling design? This part of the ceiling doesn’t have any plumbing in it and the electrical is done - so we don’t expect to need to open it.